Sort of back to some semblance of my "normal" today ... but still feeling "a bit off my feed", so really hadn't eaten all day. I didn't make it out to the Tuesday afternoon meeting that I sometimes go to up by Loyola (... met her in a club down in North Soho ... oh, wait, that's different), which often includes a run to the Taco Bell that's up there, but one of those five buck boxes was definitely still on my mind. I opted to shoot for the 8:30 down at NTAC with the "grab bag" format that's an interesting variation (rather than the 7:30 at a walking-distance church that I've been to the past couple of weeks). Much contrary to my usual "out at the last minute", I was ready to go two hours before I needed to be down to Belmont, so I had food options. I had contemplated going to Subway and trying to get some reading done around scarfing down a sandwich, either up here or down by NTAC, but that had all sorts of baggage with it (I hate getting pan-handled while trying to eat in a place), and I wasn't much in the mood for that kind of crap. So, I figured I'd take the #147 up to Loyola and get Taco Bell, then hop the El there and get back down to Belmont with plenty of spare time. However, the transit gods interfered. A month or so back, we all went out to see Ant-Man at a theater up on Sheridan, where the #147 should go, but we found ourselves on one that terminated at Devon & Sheridan, instead of heading north from there. The movie night was a pain, as I had to drag my gimpy knee a half mile or so from where the bus let us off, and one would think that I'd learn to check the destination display on the bus (like the #151 that in the evenings has some buses that only go to Foster), but nooooo. I had been kicking around for a month or so a hankering to go back to this amazing Pakistani place, Ghareeb Nawaz, which is up on Devon, a block past Damen. If they weren't "cash only", I'd probably have made it one of my regular places, but tonight I knew I had a ten on me, so this was a possibility. So, there I was, having been dumped out at the bus stop for the #155 Devon bus, with plenty of time, and a rare supply of sufficient cash. Hey, I can take a hint. I'd forgotten how huge the servings are up there. 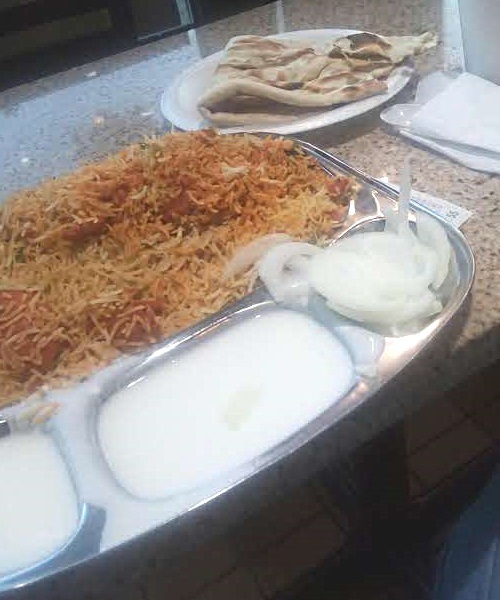 Pictured are my $5.49 order of Green Chili Chicken Biryani, plus my 75¢ side of Tandoori Nan. Yum! If I hadn't splurged on the Mango Lassi (at a whopping $1.59), this meal, that I could only make it about half-way through, would have come in at under seven bucks! Such a deal! Anyway, I dragged my extensive leftovers out with me, caught the #155, took it on back to the Red Line stop, and got down to NTAC with about 20 minutes to spare. One advantage also of going to the earlier meeting is that I get in at a kinder hour than some of the late-nite ones. Now I just need to triangulate having cash on me more often ... would like to make Ghareeb Nawaz a more frequent dining spot!